We talk with mechanical engineer Tim Quinn about advances being made in the world of photonics, wave–particle duality, and optical computing in this episode of The Engineering Commons. Carmen is pleased that Google Fiber is coming to his neighborhood. Our guest for this episode is Tim Quinn, a design engineer who works for Thorlabs in Newton, New Jersey. Carmen asks if Thorlabs has established operations in the realm of Asgard. Tim participated in Formula SAE while attending Rutgers University. Photonics is the study of how light (whether visible or not) is generated, transmitted, modulated, detected, and amplified. A photon is the quantum for electromagnetic radiation. An electron absorbs or emits photons as it moves between atomic orbitals. Photomultiplier tubes are sensitive to the presence of visible, ultraviolet, and near-infrared light, allowing a single photon to be detected under the proper conditions. A charge-coupled device (CCD) is also able to detect photons, producing an increased number of charge carriers in response to heightened light levels. Not all photons will be sensed by a CCD; quantum efficiency describes the percentage of photons actually detected. Carmen asks about the difficulty of detecting a single photon. Tim thinks we’re still at least a decade away from practical applications of optical computing. Photons have a spin of 1, while electrons have a spin of 1/2. Jeff notes that optical computing might come of age just in time to keep Moore’s Law intact for another generation. Tim references a recent Wall Street Journal article (subscription required) about this matter. We chuckle recalling Dr. Evil’s desire for sharks with lasers. Tim notes that quantum cascade lasers are gaining in popularity, due to their high power output, wavelength tunability, and room temperature operation. One can measure minute dimensional differences using a Michelson interferometer. Lasers are used in direct metal laser sintering (DMLS) to form a solid part from powdered metal (YouTube video). Bicycle parts are being printed using DMLS. Mechanical compaction is a more traditional method for forming powdered metals in advance of sintering. Fiber Bragg gratings are but one of many applications for fiber optics in civil engineering. Advances continue to be made in manufacturing light-emitting diodes (LEDs), especially in blue wavelengths. LED lightbulbs are rapidly dropping in price; at the time of this episode a 60W (equivalent) bulb could be purchased for less than $3 at major retailers in the United States. Two-Photon Excitation Fluorescence Microscopy allows living tissue to be imaged to a depth of about one millimeter. A chemical compound that emits light upon absorbing energy from incoming light (of a higher frequency) is known as a fluorophore. Optogenetics is the science of using light to control neurons. The new Apple Watch uses reflective photoplethysmography to determine a user’s heart rate. Originally founded in 1955 as the Society of Photographic Instrumentation Engineers, the SPIE is now the leading professional society for optics and photonics technology. Globars emit radiation composed of wavelengths from approximately 4000 to 15,000 nanometers, and are often used as thermal light sources for infrared spectroscopy. By comparison, visible light falls in a range between 380 and 780 nm, while sunlight spans wavelengths from 100 to 1,000,000 nm. Our guest notes that the University of Arizona has a well-respected photonics program. Tim recommends an article from Laser Focus World magazine for those interested in pursuing a photonics-related career. 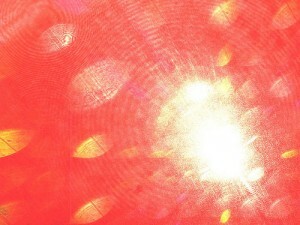 Information about the photonics industry is also available at Photonics.com. Our guest can be contacted via email: tquinn -=+ at +=- thorlabs dot com, or timothy dot quinn dot jr -=+ at +=- gmail dot com. Thanks to Steve Jurvetson for use of the image titled “Puddles of Light.” Podcast theme music by Paul Stevenson.